Here's a drum truck and cradle all in one truck. Distributes weight over 4 wheels for operator safety. Designed for safe, sure handling of 30 and 55 gal. drums. Features dual handle with vinyl grips. Sturdy 15Â¼16" OD tube frame. Adjustable clip keeps drum in place. Kick stand permits upright storage. Rolls on industrial strength mold on rubber wheels. 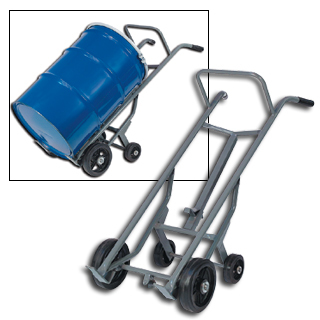 Extra back wheels assist in climbing curbs or loading pallets. FOB Shipping Point. Product No. Cap. (lbs.) Front Wheel Size/Type Rear Wheel Size Wt. (lbs.) Price Ea.